We approach organizations with a methodology designed to bring out the best in your leaders, teams, and entire organization. Our consulting methodology focuses simultaneously on three very important and critical dimensions. It is the integration of all three that truly sustains successful corporate change. We coach leaders to understand their individual styles, prioritize the organization's challenges, develop strategic direction and enhance leadership skills to successfully compete in today's environment. We partner with clients to identify the significant corporate processes, systems, and cultural nuances that are required to support sustainable growth and change. These strategic initiatives are typically sponsored and initiated at the executive level, then driven down and across the organization effectively to ensure lasting results. As a team, we are committed to creating a more balanced workplace and helping people feel good about what they do. We are inspired by organizations that serve all stakeholders. The need for strong leadership is more important than ever. The baby boom generation is aging, meaning competition will increase for skilled and knowledgeable leaders. Innovation is fast becoming a renewed focus. Corporate evolution and adjustment to an ever-changing environment requires employee adaptability and resiliency in a dynamic world. Social media and technology enable a 24/7 environment requiring organizations to become more nimble and agile. Leadership is not born but built. Leadership is not born but built. It is the outcome of business experience, training, self-development and learning. Companies must make some investment in concurrently delivering results (short term) while building long term capability in its employees. Leadership must be unearthed, nurtured and grown at all levels of the organization. Evaluation and revamping corporate talent management systems need to keep pace with new technologies, tools and philosophies. Knowledge transfer throughout the organization will enable greater solidarity, alignment and growth over time. Companies cannot afford to wait for quantifiable return on investment to understand the need. The time is now. 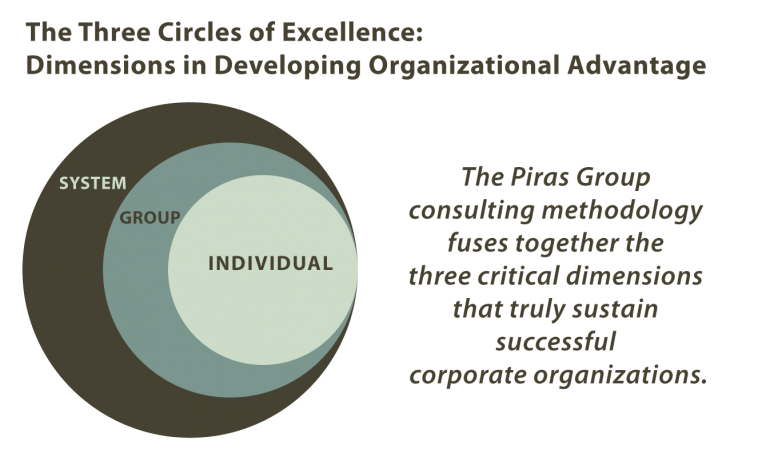 The Piras Group answers this call through its philosophy of “fusion”. 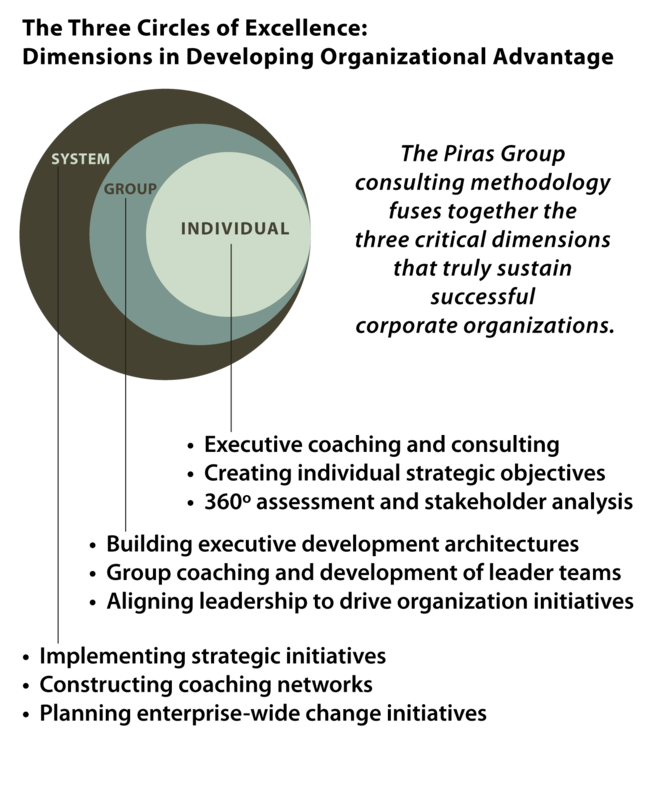 The integration of an individual leader, his/her team and the systemsunder which they reside must be looked at for new ways of operating. Fusion also includes coalescence of cultural beliefs, methodologies, and virtual teams into a unified direction while allowing local autonomy and control. It is the merging of diverse perspectives that create a more robust solution. This requires leaders to learn a new set of skills to navigate a chaotic, sometimes virtual and global environment. There is no need to “throw out” previous fundamental leadership practices. They have just become the price of entry. Overlaid is greater focus on enhancing communication and collaboration through technology, cultural diversity, decision making clarity, thinking strategically, and building leadership expertise in addition to domain expertise. Ferreting out new ideas, openly listening to new ways of doing things, then taking calculated risks will become more important that ever before. We’d like to introduce you to our team members and clients. We treasure every client we’ve worked with and hope that you’ll become a member of our community. You can build your understanding of the kind of work we do and the results we produce by perusing our case studies and taking a look at our testimonials. We invite you to call or email us for any additional information or just to get to know us better.